1. Estrogenic Zuclomipene Isomer. Clomid is actually composed of two medications, or isomers in this case, and one of those isomers (zuclomiphene) is significantly more estrogenic in its actions. For women this is not as much of an issue, but for us men, it can cause major issues, including moodiness, lowered libido, depression, etc. Furthermore, the zuclomiphene isomer has a much longer half life and, therefore, for some men seems to dominate the effects of the other isomer (enclomiphene). This is critical to understand, because the lowered libido can cause erectile dysfunction in and of itself. It has happened a number of times on the Peak Testosterone Forum where men have said that their testosterone has been boosted to 800 ng/dl or more and yet they have no sexual desire. This can create anxiety, boredom, etc. for a man and possibly lead to psychogenic erectile dysfunction. Standard testosterone therapy is generally, though certainly not always, quite the opposite and increases libido in a dose dependent manner. You can read more about here: Testosterone and Libido. 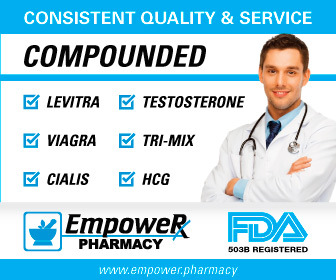 Again, Clomid can powerfully activate estrogen receptors in the male brain, and this can cause signficant issues for some men. 2. Clomid Failure or Fade. Some men take Clomid and assume that their low testosterone will increase to high levels. However, this is certainly not always the case. Their testosterone may be sitting in the 200-300 ng/dl range and after taking Clomid, their testosterone may only move up to 400 or 450. If a man has outflow issues - see my page on Venous Leakage for more information - then this may not be enough to solve his problems. In addition, he may not be getting the boost in libido and decrease in insulin levels that he needs to really increase his erectile strength and endothelial function. I should also mention that Clomid can sometimes "fade" in efficacy. Men will start out as high responders with relatively high testosterone levels, only to find that their testosterone begins to fall as the months go by. I have never read a good explanation as to why this happens, but a number of men have reported it. 3. An Overly High Dose. Many doctors do not know that there is a low dose option that works very well with many men with a typical protocol being 12.5 mg MWF. Men who are high responders, and a lot of young guys are in particular, will go quite high with this lower dose. Unfortunately, many physicians start their male patients on dosages of 50 mg per day! This is much more likely to increase the side effects of Clomid (visual disturbances, headaches, decreased mood, etc.) and lowered libido. So a man may be able to improve his erectile strength simply by going to a much more reasonable dose. 4. High Estradiol. One point of confusion with Clomid is that some men believe it is an aromatase inhbitior, i.e. that it decreases estradiol. However, Clomid is actually in a completely different class of medications, a SERM, and does NOT act to inhibit aromatase. Thus, if a man gets a boost in his total testosterone from Clomid, his estradiol will also increase through a process called aromatization in his fat tissue. So, as T goes up, so will E2 (estradiol). And, in some men, especially those with extra body fat, estradiol can actually go too high. In this case plasma estradiol levels may actually be causing issues. See my Summary Page on Estrogen and Estadiol for additional details.